For a driver showing better than Pedro Diniz did in the lower categories, Allen Berg's 8 Grands Prix are a meagre reflection of his talent. 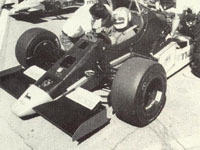 The Canadian won the Pacific division of the 1982 Toyota Atlantic championship before coming over to Britain to contest its F3 championship. Although his main opponents were Senna and Brundle, Berg usually headed up the rest, certainly after his mid-season switch to Eddie Jordan Racing. He stayed with EJR for a second season of British F3 but found Johnny Dumfries on his way to the title. The runner-up spot did not provide any progression to his career, though, Allen waiting around for a drive never to come. With nothing special to show for in his 8 GPs the Osella ride was to be his only F1 accolade. The next five years the Canadian completely disappeared from competition at an international level, only to turn up at the DTM championship for big German touring cars, with a self-run BMW. The last few seasons Allen has found a refuge in the local Mexican racing scene, happy to race the country's aging F3 and F2 (née F3000) machinery, taking the F2 title in 1995. Today he is racing in the Indy Lights Panamericana series, having won the 2001 championship.